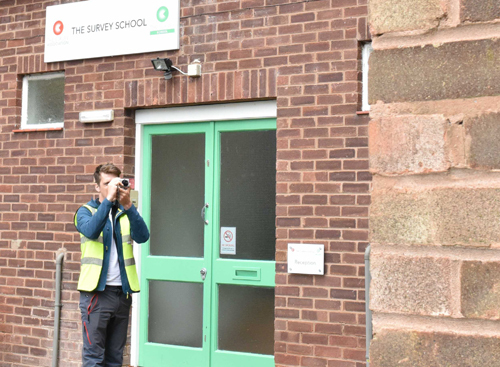 TSA recently ran its newly introduced technical short course on “Practical Photogrammetry” at The Survey School in Worcester. The course was conducted by recognised industry expert Clive Boardman and was held over three days. The aim of the course is to demystify the technique of photogrammetry which has become ever more important in recent times with the development of lightweight small aerial platforms and “off the shelf” processing packages. Most commonly associated with stereo photography and the production of maps, photogrammetry is now an accepted method of data collection in almost any sphere of measurement and competes well with other methods despite still retaining a slight air of mystery about it. The course includes both classroom and outdoor field work in a total of six sessions. 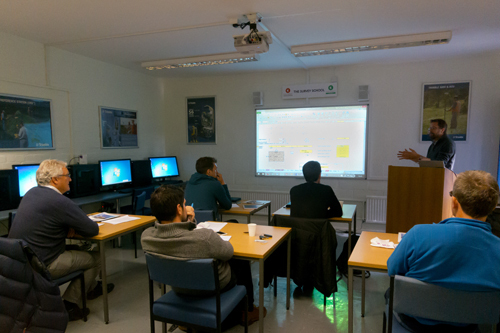 The classroom sessions concentrate on theory, camera calibration, control requirements, rectification and the use of multi-image processing software. The outdoor sessions concentrate on image capture. Most of the image processing software used in the course is now available at realistic prices and opens up the technique to a whole new audience. The course can only take six students at a time and was fully subscribed within a day of promoting it. It will be run again in December and quarterly thereafter and it is anticipated that the course will form part of the regular short course offering from The Survey School. Thanks should go to EOS Systems in Canada for the loan of multiple PhotoModeler licences and Agisoft for their support. The feedback from the students indicated that the balance of theory versus practical was ideal and all attendees stated that they would recommend the course to others. More information on the photogrammetry course can be found here.